Welcome to our first field trip of 2019. In fact, this issue marks the first true Insider field trip since Sept. 5, 2017, when we hit up Penacook, Boscawen and Canterbury in a 3-for-1 deal. That was back when there actually was a we in the Insider. Nowadays it’s a one-man show, and though it’s certainly harder to cover a lot of ground alone, I found a way to get out to Hooksett last week and discover some really cool places. You might recall a previous trip to Hooksett – we went in April 2017. While we covered quite a bit of ground in that issue, there was still so much of the town that we didn’t get to see. That’s why I went back again – to find even more stores, restaurants, bars, entertainment centers and everything in between. Because I took several separate trips into town to accommodate the schedules of various people and businesses, this feature will not be very linear, as past field trip issues have been. Instead of taking you through my journey step by step (the steps often didn’t make sense logically), I’ll just lay out everything I came across arranged by category. Let’s start with the tasty stuff first. The first eatery I visited on this trip was Giovanni’s Roast Beef and Pizza, located at 209 W. River Road inside a small strip mall. After polling the Monitor newsroom asking for suggestions of things to try in Hooksett, there were many responses telling me to check out Giovanni’s. As luck would have it, it happened to be right next door to another business I had a meeting with (more on that later), so I stopped in just in time for lunch. 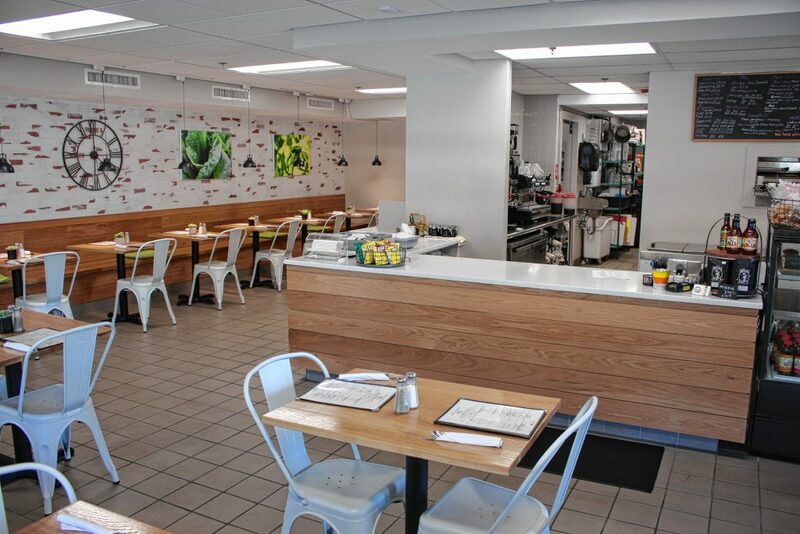 The menu features a lot of standard pizza place fare – pizza, salads, hot and cold sandwiches, pasta, etc. What I was interested in was the roast beef, of which there are three options on the menu: Super Beef, Regular Roast Beef and Jr. Roast Beef. These are basically all the same thing, just different sizes and served on different types of rolls. Obviously, I wanted to go for the biggest one possible, so I ordered the Super Beef, which is served on an onion roll, and I asked for some American cheese on it, too. Other than that, I gave no special requests. Much to my delight, the sandwich was brought over to my table within a minute of ordering, and it was nice and hot. 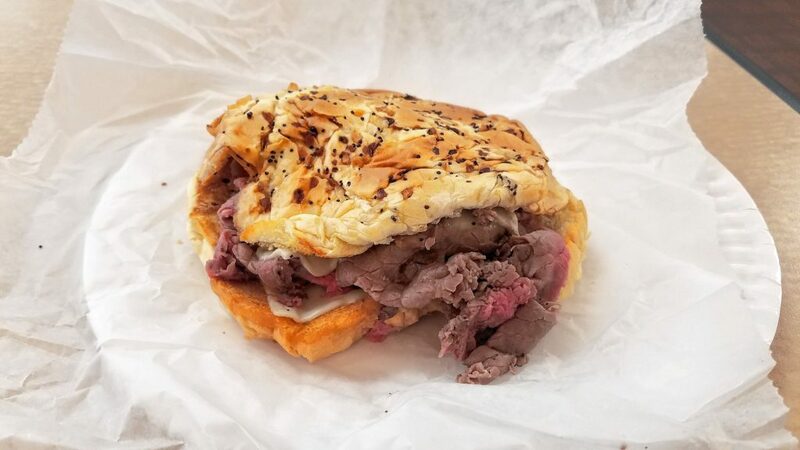 It did look a bit funky, as though the sandwich somehow got squished on its way from the kitchen to my table, but it did look tasty, with a big wad of medium-rare roast beef in the middle and a somewhat artisan-looking onion roll with big pieces of onion. The first bite went very well. It was good and warm, and very tender. The beef tasted like straight-up beef – no horseradish or mayonnaise or mustard or anything like that to get in the way. I also liked how this roast beef was closer to medium-well than medium-rare – I know many people love their roast beef as rare as possible, but I prefer it cooked a bit more. I really appreciated not getting leaked on by this sandwich, which isn’t always the case with roast beef. I guess with nothing but beef, cheese and bread, it shouldn’t really be a drippy sandwich, although you never know what kind of shape the roast beef will be in when you go to a place for the first time. This roast beef succeeded in being tender and juicy without ever leaking a single drop of juice or making the roll the slightest bit soggy. At $6.99 for two pieces of bread, a serving of roast beef and a slice of cheese, it isn’t exactly the greatest deal going, but if you like roast beef, it’s hard to argue with the product. Visit Giovanni’s at originalgiovannis.com or call 935-9820. Having quickly become a veteran of the Concord location of Tucker’s (I have lived dangerously close to this place for about four years), I knew I had to give the original location in Hooksett a try. My Monitor buddies agreed, as multiple people recommended I check it out. I went in at a time that I figured wouldn’t be too busy – a little after 11 a.m. on a Wednesday. This should be after the big breakfast crowd but before the big lunch rush. Wrong on both accounts – it was pretty packed in there, although it didn’t feel quite as crowded due to the huge windows lining every wall letting in tons of sunlight. I got a small table in the main part of the dining room and started with a glass of water and a cup of coffee. Strangely, it took a good 20 minutes from the time I got my coffee until the waitress came to take my order. It was certainly busy in there, I’ll give her that, but it did seem like a very long time to wait just to place an order. It didn’t take quite as long to come out as it did to order, but either way, by this time I was very hungry and couldn’t wait to dive in, especially after I saw the plate, which was masterfully assembled. I’m not one to place too much emphasis on presentation – I’d take a good-tasting, bad-looking meal over a good-looking, bad-tasting one any day of the week – but this dish really looked awesome, even with that big glob of guac on top which I could’ve done with less of. The first bite was very savory and bold. That chipotle sauce really blended well with the Mexican-inspired ingredients, and the chopped veggies actually had a ton of flavor, too. Every bite tasted fresh, and the flavors really did jump out. Underneath the scramble was a nice portion of crispy hash browns, one of my favorite breakfast foods. These tasted homemade, and I loved the level of crisp they had, which provided a nice change in texture from the mostly soft scramble. If not for the hard-to-ignore delay in being able to place my order, this would have been an all-around superb experience. In the end, it was just a very good experience, and one that I would absolutely like to have again, if I’m ever out that way again. For more, go to tuckersnh.com, stop in at 1328 Hooksett Road or call 206-5757. Another stroke of luck brought me to a barstool at Cues & Cushion, an old-school billiards bar in the K-Mart plaza, very close to where I had another appointment a little later (more on this, too, in a little bit). It’s an unassuming little place, tucked away in the corner of a strip mall between two really big stores, but I’m glad I took an extra second to look it up and ultimately go inside. This is a no-frills kind of place – you come here to play pool and grab a drink and/or a bite to eat. Although it was the middle of the day, this did not strike me as the kind of place you’d go to for a night of dancing or a fancy dinner with work clients. This felt like the kind of place you’d go to after work on a random Tuesday night to meet your buddy for a round of pool and a can of suds. 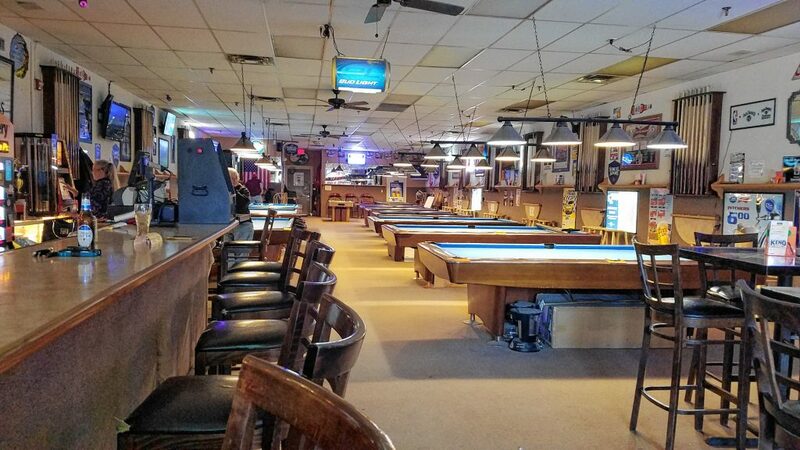 The place is one big room, with the bar right up front as you walk in and most of the rest of the floor space taken up by 11 traditional pool tables and one bumper pool table. They also have some video poker machines, a big arcade game where you punch something as hard as you can (it wasn’t on during my visit) and, perhaps most importantly, keno. For whatever reason(s), we still don’t have the popular bingo-style game here in Concord, but having always liked the game, you better believe I was pumped to play here – maybe this could pay for my whole trip? I went over to the self-serve kiosk to play my standard 4-spot game, which carries approximately 1 in 4 overall odds of winning. I inserted my dollar, pressed a few buttons, chose my game and pressed the button to print my ticket. The only problem was, well, it never printed. Meaning never – I left before it ever came out. Apparently the machine had just run out of paper right before I tried to get my ticket, and replacing the roll requires a complete reboot of the system, which apparently takes more than 25 minutes. In any event, I filled out a couple of keno tickets the old-fashioned way, using a golf pencil to fill in bubbles on a piece of paper, and handed my two tickets to the bartender, who produced keno slips for me at once. Not that it mattered – I lost both games, costing me $2 in the process. It wasn’t all failure, though. 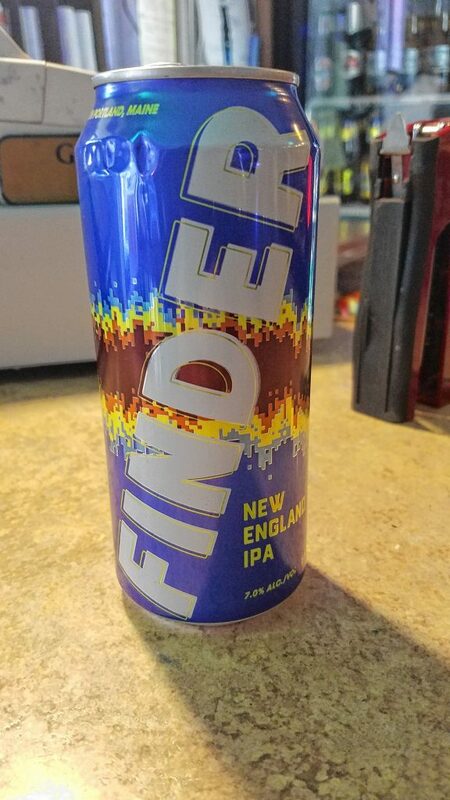 I ordered a beer I’d never had before, Shipyard’s Finder New England IPA, and I really liked it. This was one of the few non-commercial beers available, as the bar primarily stocks all the big names like Bud, Coors, Pabst and so on, but it ended up being a good all-around beer. I found this to be one of the more accessible New England IPA’s I’ve tried so far. The hop flavor is definitely there, but it isn’t too strong. It has 7 percent alcohol by volume and comes in a pint can, but I never really felt it creeping up on me. It was pleasantly juicy but not overly fruity and definitely not lacking in actual flavor. This was just plain-old good beer, one that I will likely add to my regular rotation going forward. Find Cues & Cushion on Facebook, stop by at 1271 Hooksett Road or call 623-5330. The reason I was at the Shaw’s plaza, where I found Cues & Cushion, was because that’s where Cowabunga’s is, and I wanted to check that place out. Cowabunga’s bills itself as New England’s largest inflatable playground, and while anecdotally it seemed smaller than the bounce house place at Steeplegate Mall, it’s plenty big enough for all your kids to run around and burn off energy for hours. This place is like a cross between the place at the mall and Krazy Kids in Pembroke. 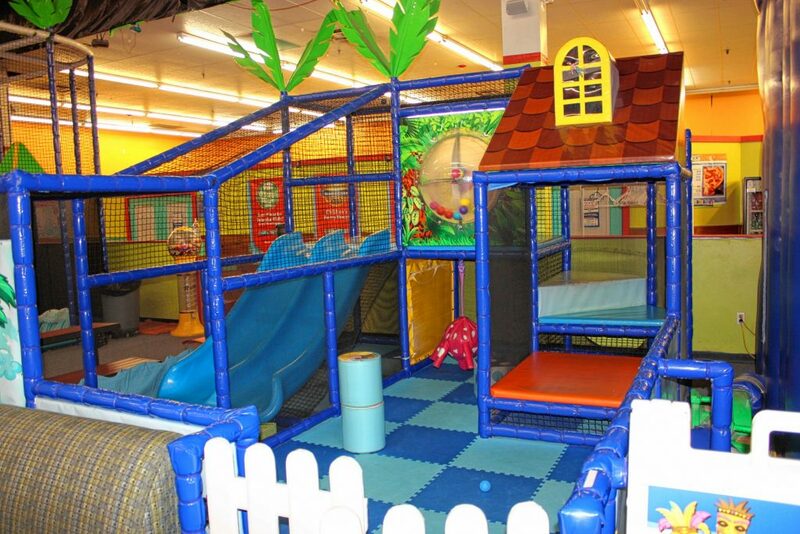 There are big, inflatable bounce structures that make up most of the open gym area, and a big climbing play structure called Tiki Blast, which is only available at this Hooksett location (there are also location in Manchester and North Reading, Mass.). Tiki Blast is not inflatable and it has multiple levels for kids to climb up and obstacles to deal with. There’s also a toddler-specific area in front of Tiki Blast. Cowabunga’s is for kids of all ages, but sometimes the littlest ones do better in a smaller, more controlled environment free of bigger kids and teenagers and the like, said manager Sydney Alfonso. Outside the main open gym area are several sections divided by walls and doors. 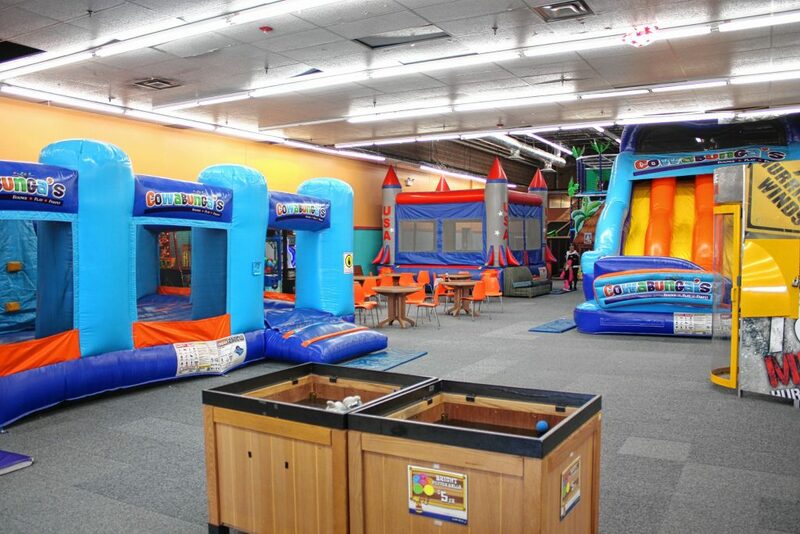 For private parties, a whole gym room with its own bouncy equipment can be rented, giving your party an exclusive feel when you’re not out among the rest of the crowd. 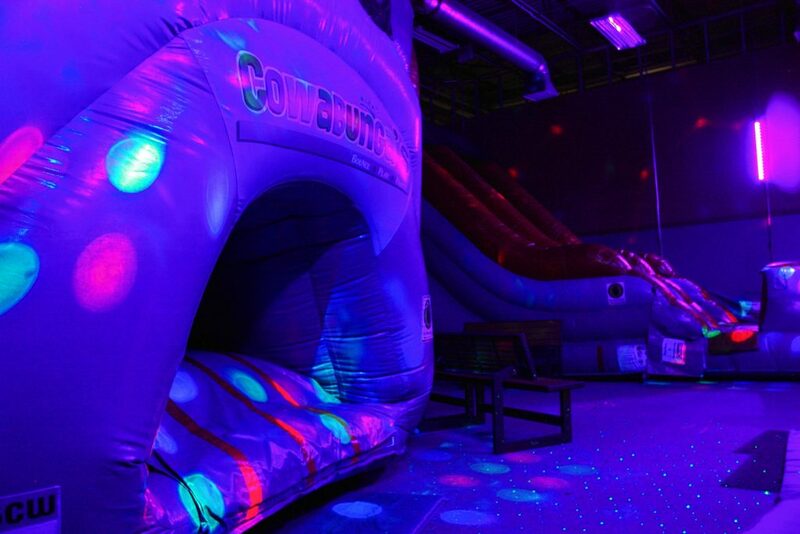 There are three party rooms and two party gyms, and one of the gyms can be done as a glow party. All of these rooms get heavy use, especially during periods where school is out, Alfonso said. “We’ll have back-to-back parties most of the day on weekends,” she said. After checking out the glow party room, it was easy to see why – it felt like some kind of sci-fi space scene in there, only with all kinds of bounce house structures everywhere. All of this fun can be had for relatively short money. Parents and children too young to walk don’t have to pay, and admission is $12 per walking-age kid, with re-entry allowed. The admission price is good for the whole day, and includes access to everything inside, with the exception of a few prize-vending arcade games, which you’d pay for separately. Every child must have a waiver filled out before playing, and that goes for every time you go. Better safe than sorry. For much more on Cowabunga’s, go to mycowabungas.com or call 325-8008. There’s a lot that can fall under the umbrella of family fun, and in New Hampshire, just a few hours from the Canadian border, hockey and ice skating in general are often the central recreational outlet for hundreds of families, going back generations. That’s why it’s fitting to include Tri-Town Ice Arena among the family fun options in Hooksett. This arena is big – there are two full-size hockey rinks with a café area overlooking both rinks, a TSR Hockey pro shop, a specialized athletic training center (like a small gym made specifically for athletes), the Amazing Smiles Family Dental Center office and an outdoor rink made for Dek Hockey, an old style of street hockey in which players run around in sneakers on a tile surface. Mostly, though, this place is all about hockey, and good hockey, at that. 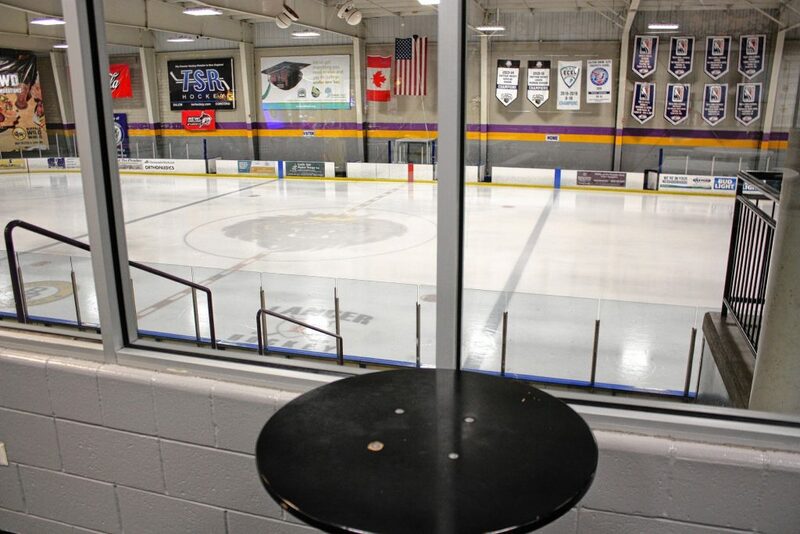 Tri-Town Ice Arena is home to the New Hampshire Junior Monarchs, a Tier III Junior A hockey program playing in the United States Premier Hockey League. Within the USPHL is the National Collegiate Development Conference made up of 12 teams in the Northeast. The Junior Monarchs team of the NCDC division within the USPHL is the highest-level team in the program, said Jeremy Vega, who runs the arena. Coached by Ryan Frew of Concord, the Junior Monarchs NCDC team is a high-level club that features players looking to play in college or even the pros. The Junior Monarchs have produced 135 Division-I college placements and nine NHL draft picks, so there’s plenty of reason to look at this league as a route to bigger and better things. “We’ve put over 200 kids in college through scholarships,” said Rick Vega, the dentist who works out of the building and the father of Jeremy Vega, who oversees the rest of the arena. But, of course, well all have to start somewhere, and the Vegas realize that, which is why they offer skating and hockey programs for kids as young as 3. At age 3, kids can get involved in what’s called the Mini Monarchs, and they can join the youngest group of the Junior Monarchs by age 4. There’s also open public skating offered usually five to six times a week, Jeremy said, depending on the schedules of the rinks. The aforementioned outdoor Dek Hockey rink is pretty new, having just broke ground last summer. It’s operated by Manchester Area Dek Hockey, who leases the space from the arena. Dek Hockey has been around a long time and has always been popular in Massachusetts, Jeremy said, and it’s starting to spread across the Granite State now, too. It’s basically like a slower version of street hockey, in which players run around in their sneakers instead of wearing rollerblades. Players are required to wear most traditional ice hockey safety equipment such as a helmet with a face mask, gloves, shin guards and elbow pads. Goalies must have a full set of goalie pads, either for ice or street hockey. Back inside, one of the amenities of the arena is the café area. 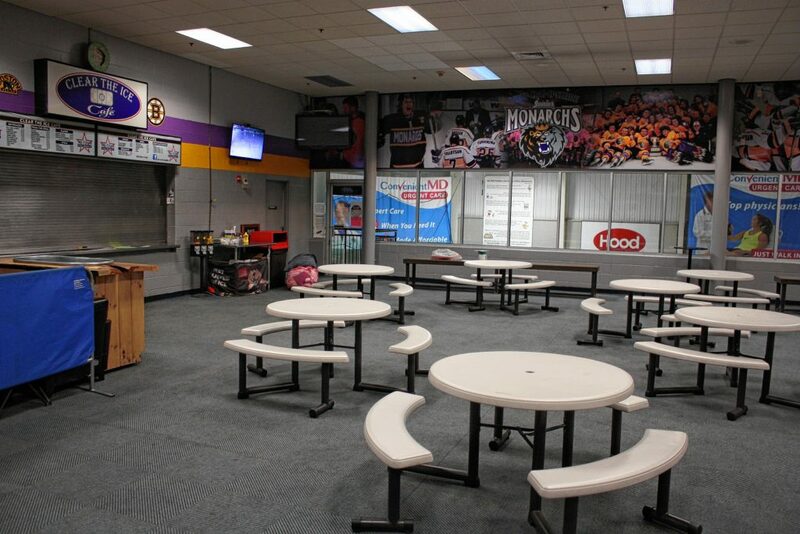 This area sits above and between the two ice rinks, so spectators can watch a game from the warmth of this café lounge while sipping on a beer and/or having a pretzel or a hot dog. Some small, high-top, bar-style tables are placed up against the glass so you can have a bite to eat while you look out at the action down below. Between periods, you can pump some change into the handful of arcade games they have in this area to pass time. For more information on the arena, including rink schedules and directions, go to tri-townicearena.com. This final section is primarily for adults. Before your imagination starts running wild, know that this is not that kind of adult section. Rather, the businesses featured here just wouldn’t be of much interest to younger folks, nor would most youngsters be able to afford or legally purchase anything they sell. With that out of the way, let’s dive right into this. As long as I’ve been with the Insider, nobody has ever gone to check out a gun store – probably because Concord doesn’t have one. While guns are inherently dangerous, the fact of the matter is that they do exist, they are legal to buy (for most people) and in the Live Free or Die State, they are quite common and popular. Hooksett just so happens to have a few gun shops, but one in particular really stands out because it does quite a bit more than just sell guns – Shooter’s Outpost. Shooter’s Outpost is a big, sprawling ranch-style shop with two floors absolutely loaded (see what I did there?) with merchandise. It’s owned and operated by the husband/wife duo of Jim and Carey (not Jim Carrey) McLoud – Jim is an Army veteran, so he has quite a bit of experience. Carey has plenty of experience, too – she and Jim also used to own Manchester Firing Line, a shooting range and retail store, before selling that a few years ago to go all-in on Shooter’s Outpost. The store sells all kinds of firearms and ammo, plus accessories and safety equipment. They also consign items, keeping 15 percent of whatever consignment sales they make, and they service weapons through an offsite gunsmith. The McLouds put an addition on the shop recently which doubled its size. The move was necessitated, in part, by Jim’s massive personal collection of weapons from every era. Many of these used to be on display at Manchester Firing Line, but his collection eventually grew too big for that space. That’s where the museum, which lives inside Shooter’s Outpost, came from. “Jim has a very large collection of firearms,” Carey said, as Jim tried to hold back a proud smirk. It is an impressive collection, and one that the public ought to be able to check out, which is why they decided to create a museum in the ground floor of the shop. In the museum, one of the first things you’ll notice is a military Jeep fully stocked as though it were going out to battle today. There’s also a whole wall dedicated to original Thompson submachine guns – the infamous “Tommy Guns” used by movie and real-life gangsters back in the 1920s. 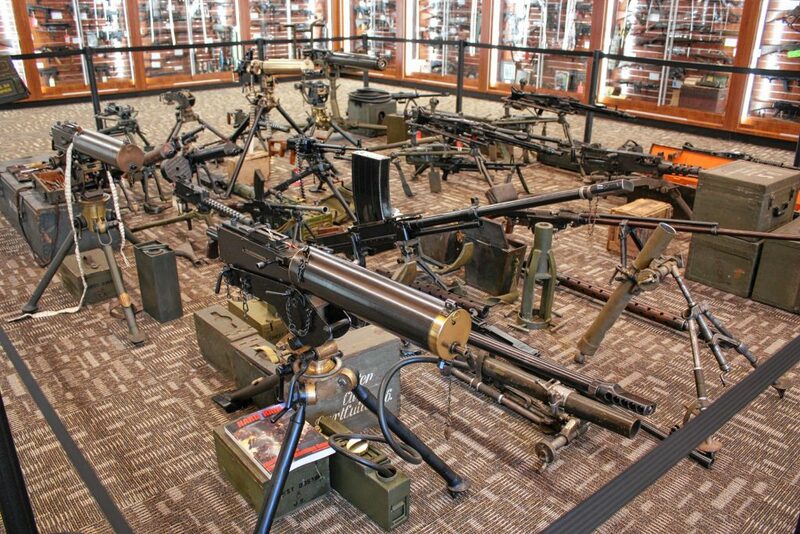 In the center of the museum is a roped-off section displaying some serious firepower, weapons that were meant to be stationary or mounted to something – pretty much everything in the center of the museum is too big to wield in hand. One noteworthy item from this section is a water-cooled machine gun that was used by Fox Studios for several movies – it still has a clearly visible “Fox Studios” stamp impressed in a section of brass trim on the gun. The museum also contains the actual grenade launcher that was attached to Tony Montana’s rifle in the famous final sequence of Scarface, the scene that gave the world the classic line, “Say hello to my little friend!” Al Pacino, as Montana, then fires the grenade launcher, and that exact launcher is in the museum. At the entrance to the museum is a big 55-gallon drum that serves as a donation bin for Harbor Homes, an organization that helps homeless veterans. Over the last two years, Shooter’s has donated more than $24,000 to Harbor Homes, thanks in part to the donations made by some customers. “Sometimes people will throw $100 in,” Jim said of the donation barrel. Apart from the museum, the shop also features the Copper Jacket Cafe. Neither of the McLouds know of any other gun shops around that have a café inside, but it actually makes a lot of sense. “The café was a natural fit,” Carey McLoud said, “because we have background checks.” Background checks can take anywhere from 20 minutes up to a few hours, depending on how busy things are, and the McLouds used to always tell people to run down the street and grab lunch while they wait. Now, customers don’t have to leave the premises while they wait for their background checks – they can just go downstairs and hang out in the very bright, clean, new, fresh-looking café that you would have no idea is part of a gun store. The café even has its own entrance, so if you’re driving by and have no interest at all in purchasing a weapon or ammo but have tremendous interest in purchasing a sandwich, you can just run it and grab some food and be on your way. 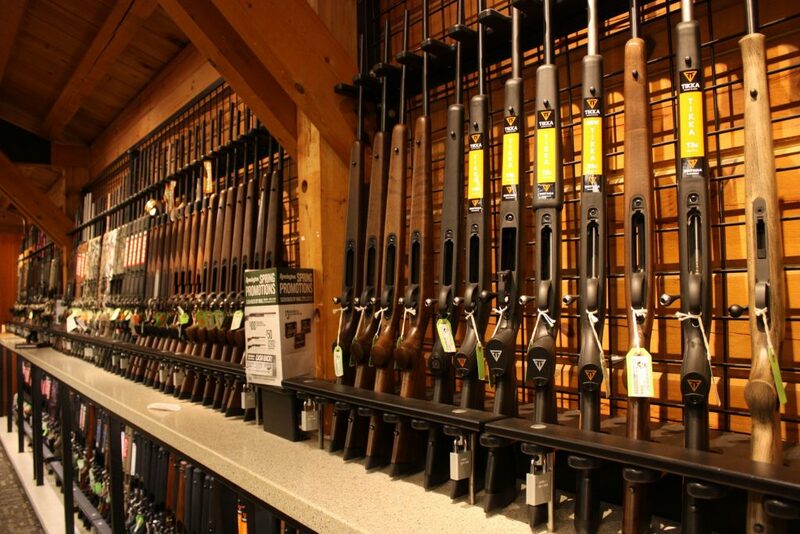 That thing about background checks plays into a much larger theme at the store – safety. You of course can’t talk about guns without talking about safety, and the McLouds were happy to go on at length about how passionate they are about safety and education when it comes to firearms. For starters, the shop offers free two-hour safety courses every month. These are intended to be basic courses for people who are new to firearms and want to get a good run-down on how to safely use, clean and store your firearm. 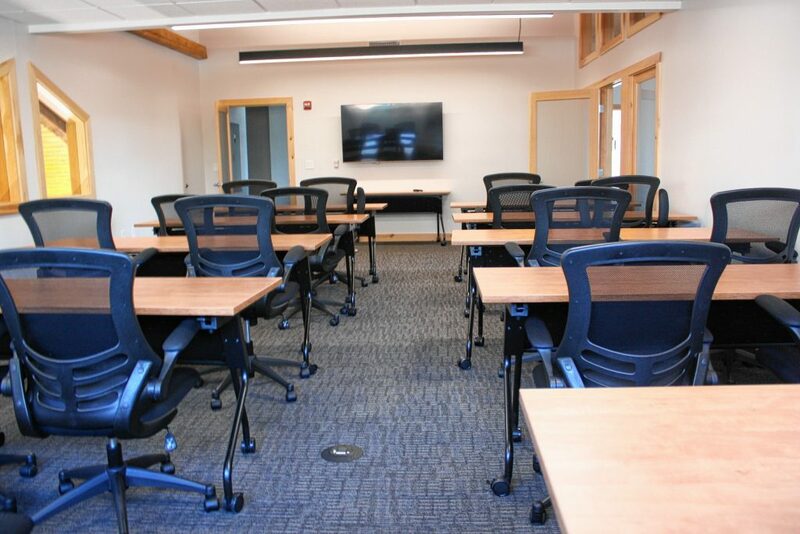 They take these classes so seriously that when they put the addition on the building (work for which started in 2017), they had a full classroom capable of seating 20 people built specifically for these safety classes. The room has a big TV at the front, very comfortable chairs and windows looking down into the museum. They also sell all kinds of safety equipment. There’s the tried and true, traditional gigantic safes that have been around forever, but there’s also a lot of modern, high-tech stuff that offers extra levels of safety. The store carries a variety of Vaultek cases, which are the cutting edge of gun vault technology. These cases can be locked and opened using fingerprints, a digital combination code or a key, and they can be set up to connect to your phone. 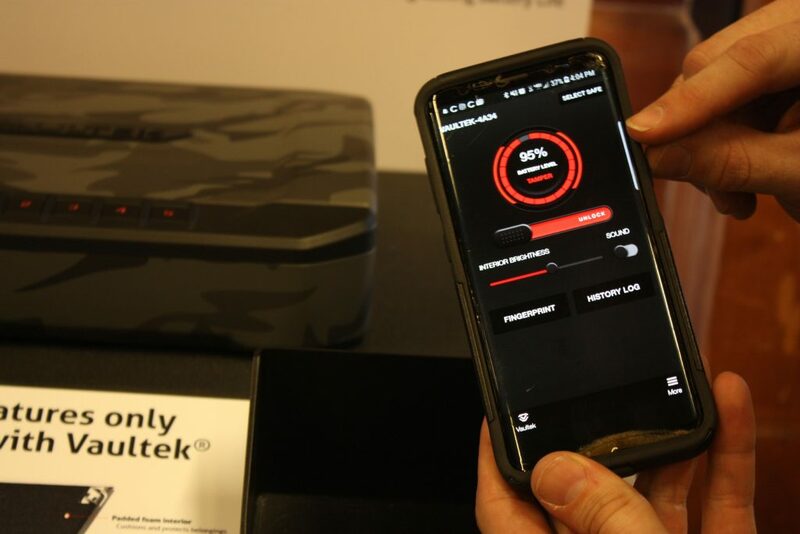 One of the major features of these Vaultek safes is their ability to alert the owner of any suspicious activity with the case. If someone enters a wrong code or uses an unauthorized fingerprint, the safe sends a message to the owner’s cell phone letting them know someone just tried to get into the safe. The owner can also use the phone app to open the safe, and the app includes a battery life monitor showing how much juice the vault has left. In the event that the internal, rechargeable battery dies with all the contents inside, a manual key can override everything and open the safe. The McLouds also take great care in making sure their store is as safe and secure as possible. Jim has built layers upon layers of redundancy into the store’s security system to ensure the maximum level of safety possible. I’m certainly not giving away any of his secrets here, but let’s just say you do not want to try to do anything out of order at this shop – it will likely end extremely badly for you. For now, this Shooter’s Outpost is the only one on earth, but that won’t be true for long. The McLouds plan to open another location in Amherst in the next few months, and who knows what will happen from there. For more info on everything Shooter’s offers, go to outpostnh.com. 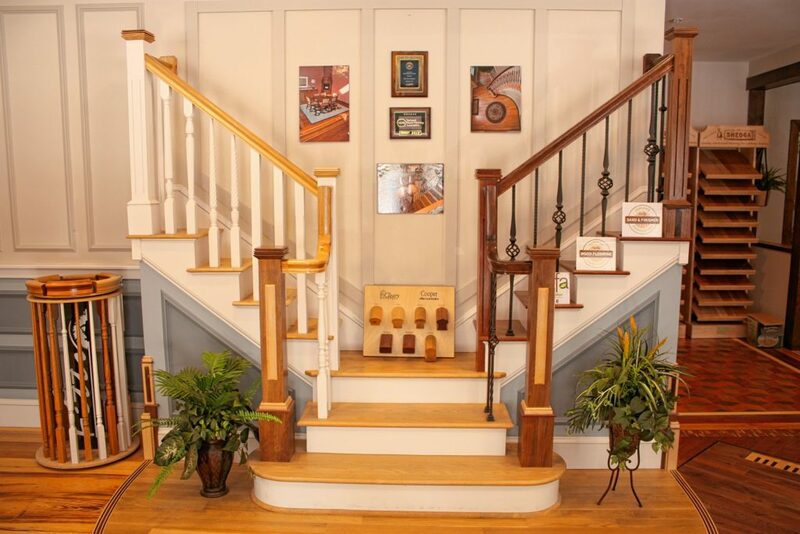 Olde Tyme Craftsmen is placed under the “For adults” section not because it sells extremely dangerous products, but because, well, teens and tweens don’t typically have a ton of interest in high-end hardwood flooring and stairs (but they should!). Owner Ron Charpentier has been in the business for about 37 years, and up until recently it had been run out of his house. In September, he had a grand opening at the new storefront at 209 W. River Road, which serves as a showroom for the public and a much-needed warehouse out back. For a place called Olde Tyme Craftsmen, there’s plenty of brand-new, cutting-edge technology used. The business recently acquired a new router developed by MIT that’s made for creating custom shapes. Similar in some ways to those Cricut machines that are all the rage in the crafting world these days, this machine uses computer input to cut custom shapes out of wood. As Charpentier was getting familiar with the tool, he made a smiley face cutout that could then be inserted right into someone’s floor. To be clear, Olde Tyme is pretty much nothing like a Home Depot or a Lowe’s. The storefront is closer to the size of a convenience store than a commercial warehouse, and that’s all it needs to be – after all, the business is one in which guys from the company show up to your house with stock and install a floor, set of stairs or a railing. The West River Road location serves mostly as a warehouse but also to display some of the custom, detail-oriented work the shop is capable of doing. Like Shooter’s Outpost, Olde Tyme Craftsmen is also a big supporter of the military and veterans. Olde Tyme is also big into charity work. “We get approached by a lot of groups about charity,” Charpentier said. The business was recognized with a 2017 BCCP Philanthropy Award for doing work for veterans at no charge. Olde Tyme also donated work and material to the Designer Showroom in Nashua. The store is a Bona Certified Craftsmen, which is a big deal. 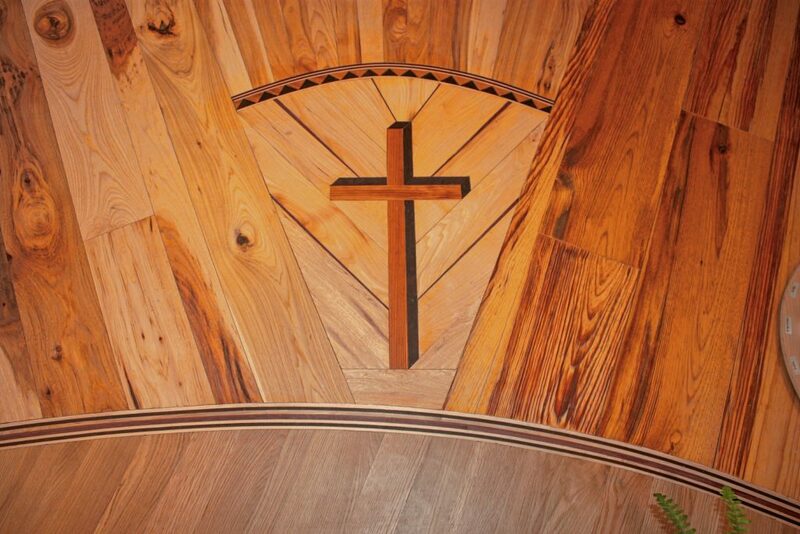 Bona is a company that makes floor finish, but they also push for education in the industry. Olde Tyme has been using their products for eight or nine years, and having the certification assures customers that the work to be performed in their homes will be dust-free and environmentally friendly. Small-scale operations don’t have access to the type of equipment that Olde Tyme does, so if you want a truly dust-free, professional-grade experience, you can’t do much better than a Bona Certified Craftsman, which Olde Tyme is. 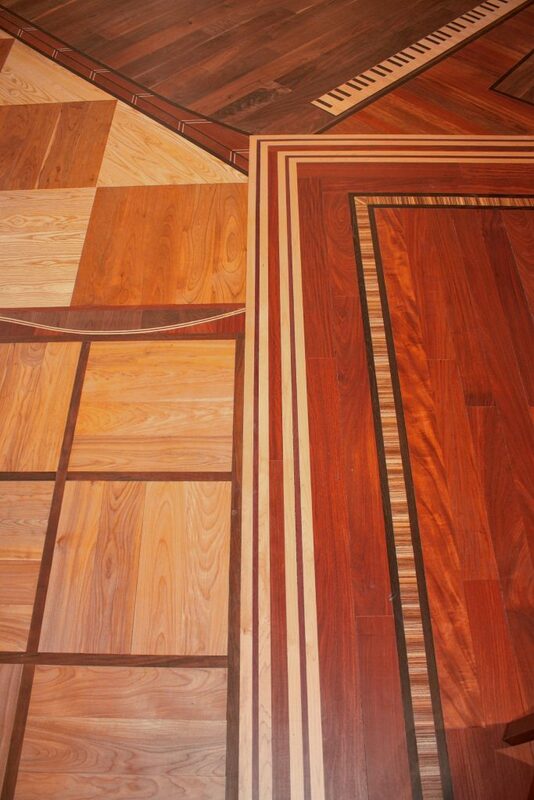 In terms of products, Olde Tyme can pretty much install anything – standard prefinished hardwood, unfinished traditional and/or exotic hardwood, engineered/floating floors, custom shapes and patterns, ornate grand stairways and everything remotely associated with those things. 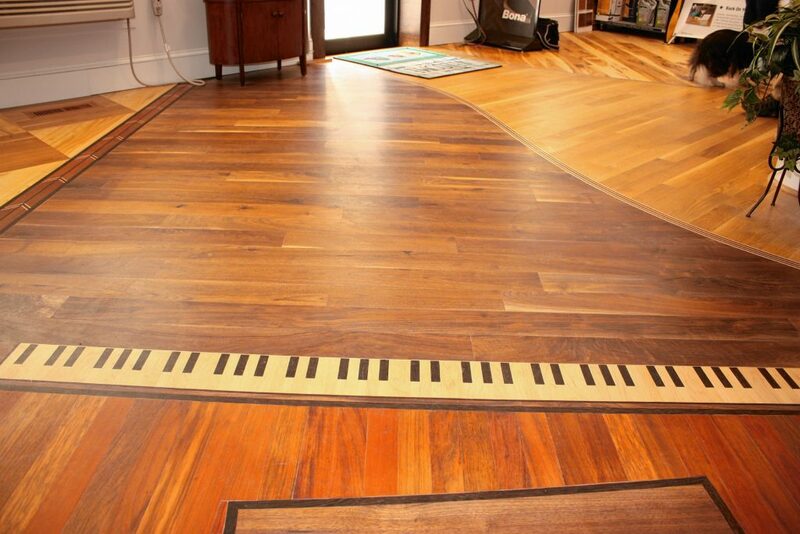 Basically, if you can walk on it, Olde Tyme can install it in your house. The showroom is open by appointment only, so go to nhwoodfloors.com to poke around a little, then give them a call at 624-1855 to set up an appointment. You can also find links to a blog and photos of some of the more unique projects they’ve done on that website. 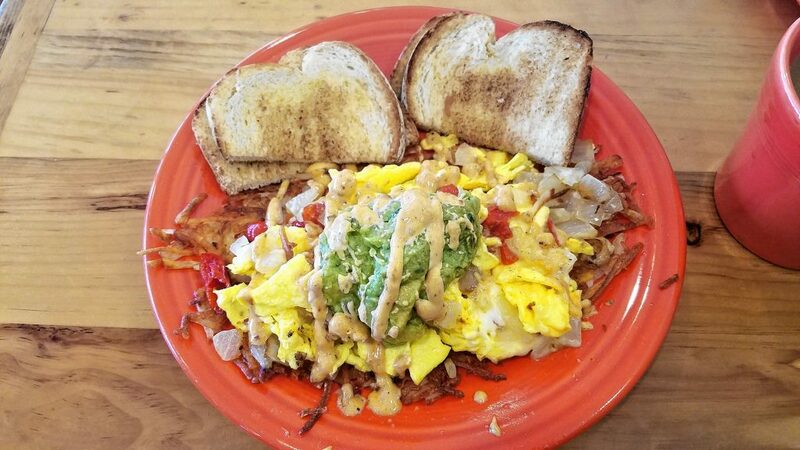 Hopefully you have enjoyed this trip to Hooksett, and if you’re thinking of going there any time soon, be sure to think about checking out all the places featured here!